A Russian lab student from Okayama University shows off the latest crop of "space barley"
One hundred bottles of beer on the wall, one hundred bottles of beer, if one of those bottles should happen to fall... it would drop 217 miles, to be exact. That's the distance the International Space Station orbits, and where the barley used to brew these very special one hundred bottles of "space beer" spent five months in 2006. The barley used to brew the brew, as it were, is actually a third generation crop grown from grains brought to the ISS in 2006. The brewmeister is Sapporo Holdings, one of Japan's largest makers of beer and other alcoholic and non-alcoholic drinks. Supposedly there is no difference in taste between the space seeds and barley grown on Earth. Even so, the 100 bottles of space beer carry a very special cachet and ought to make treasured gifts as Sapporo has no plans (as yet) to actually sell them. "We want to finish the beer by November," stated Sapporo executive Junichi Ichikawa. "It will be the first space beer." Sapporo got the nod to brew the astro ale from Manabu Sugimoto, an associate professor of biology from Okayama University. 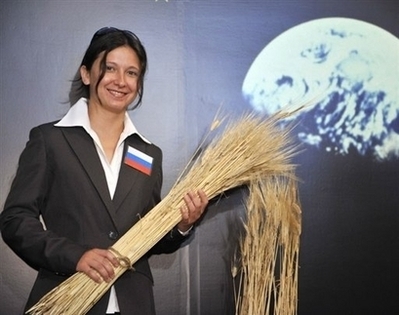 Sugimoto has been participating in a Russian project that is investigating ways to grow edible plants that may sustain future astronauts (and cosmonauts) on long space voyages. Barley is well-suited for "space farming" as it can withstand a wide range of temperature differentials and happens to be a good source of essential nutrients and fibre. It's also an essential ingredient of beer, a fact not lost on Sugimoto. "In the long run, we hope our space research will be not just about producing food, but about enjoying food and relaxing." We'll drink to that! USB Healing Owl is a Real Hoot!